Eagle Superabrasives is a premier supplier of super abrasive supplies located in the United States. With an extensive inventory of grinding wheels in stock at our Hickory, NC location, ninety-percent of orders are ready for same-day shipping. Custom orders can be shipped in as little as seven days. Grinding Wheels contain hundreds of thousands parts of superabrasive grains, each of which exhibit multiple cutting edges. A grinding wheel that contains the proper bond and superabrasive for working with a specific material will be able to constantly sharpen itself as well as extend the life of the wheel. A grinding wheel sharpens itself by causing the grains to fracture and then release, resulting in new sharp cutting edges that line the surface of the wheel. Choosing a grinding wheel can be a daunting task, especially if you’re use to conventional grinding wheels. 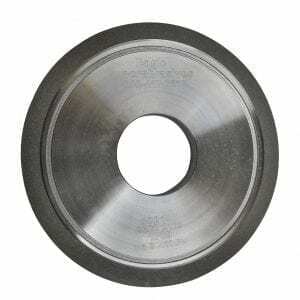 Grinding Wheels typically come in four different abrasive types; aluminum oxide, silicon carbide, diamond and cbn. Eagle Superabrasives offer a variety of grinding wheel abrasives including Diamond, CBN, Borazon and CDX, all of which offer high performance grinding. When choosing a grinding wheel for your workpiece, you must consider the abrasive grit size. Grit sizes follow an established U.S. standard that is numerical. The smaller the number, the coarser the grain of the grit. Contrarily, the larger the number, the finer the grain of the grit. Typically the smaller the number will increase the stock removal rate, but yield in a less desirable surface quality. Finer grit sizes provide less stock removal, but a much better surface quality. Next, the hardness grade of grinding wheels is ranked alphabetically (A to Z, soft to hard). The grade represents the amount of bond that the wheel contains. The bond is what holds the superabrasive grain to the core of the wheel. Typically harder grades produce better surface quality, but result in smaller chip removal rates. Bond type is very important. The bonding agent is what determines the life of the wheel. Eagle Superabrasives, chemist and engineers are constantly researching, testing and developing new bond formulations to ensure the integrity of our wheels. When you’re ready to try the best, trust the experts at Eagle Superabrasives. Our experienced staff will provide you with superior customer support and service. They will deliver prompt, insightful technical support and on any product you purchase. Contact us today!